You should be aware at this point that I have a true fascination and appreciation for the guitar....and guitarists. Segovia, Presti, Boyd, Metheny, Montgomery, Svoboda, Zappa, Vai....and so on. Yes, I am a violinist, and that will always be my first love, but I did teach myself to play guitar when I was 15 and have enjoyed the instrument ever since. 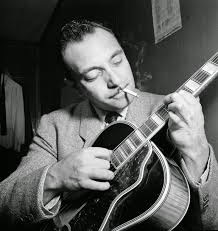 Of all the guitarists in history, perhaps none have a story as compelling and interesting as Django Reinhardt. I learned about him many years ago, and routinely listen to his recordings. He was born in Belgium in 1910, and moved to France where he lived his entire life. I am not going to throw his biography at you...you can read all about him on Wikipedia, but there are a couple things I will point out: he was severely burned in a fire when he was 18 and lost the use of his 4th and 5th fingers on his left hand, as well as being burned over half his body and losing the use of his right leg. Told he would never play the guitar again, he refused to believe this and taught himself to play with just two fingers and his thumb. When you hear him play, it's almost impossible to believe anyone could be shredding a guitar and comping chords like he does with only 2 fingers. I can't play that many notes with all four fingers and thumb! Django later teamed up with violinist Stephane Grapelli and formed the Hot Club of France and created a form of jazz that spread all over the world. Django appreciated classical music, and was very aware and connected to other French artists and composers. He wrote a tune called Nuages, just as Debussy had in 1899. He also wrote a tune called Bolero....yep, just like Ravel had in 1928. He also recorded Debussy's Reverie in 1950. In his book "Django: The Life and Music of a Gypsy Legend", author Michael Dregni talks about Django's appreciation of Debussy and Ravel. "After Bach, Debussy and Ravel were Django's favorite composers; they were near contemporaries of Django and also thoroughly modernistique". Stephane Grapelli went to a concert with Django in Paris where they heard music of Berlioz. "He liked great things and I believe he experienced them in a way they should be experienced. To see his expression in the glorious church of St. Eustache in Paris, hearing for the first time the Berlioz Requiem, was to see a person in ecstasy". Django stayed in Paris during the Nazi occupation of France. As a "gypsy", he was lucky to survive the war as many of France's gypsies were sent to concentration camps and killed. He did try to escape on more than one occasion but was unsuccessful. Luckily, there were some Nazis who enjoyed his music and protected him despite the Nazi party's official condemnation of jazz. After the war, Django teamed up with Duke Ellington for his one and only tour of the United States in 1946. And as you can tell from the title of this entry, he played here in KC! I had found a citation that referred to a tour stop here in November 1946. I went to the KC Public Library and looked through the KC Star and Times from November 1946 and found a promotional ad for Duke Ellington at Municipal Hall on November 17. But Django was not mentioned. Then I found the review! BUT, again, there was no mention at all of Django. Huh? Weird. So I kept looking and found nothing else. And I knew from a previous citation that Duke and Django gave their last performances on November 23 and 24 at Carnegie Hall in New York. There were no other dates they could have come back to KC. I left the library thoroughly perplexed. I called Chuck Haddix at the Miller Nichols Library at UMKC for help. He remembered hearing that Django had played at the Pla Mor Ballroom at the corner of Linwood and Main around that time. ????? Pla Mor???? I had never heard of that place. So one of the greatest guitarists of All Time came to KC and performed with the legendary Duke Ellington. I have written about my fascination with the intersection of musical styles and forces in music and culture. Just as Gershwin could combine jazz and classical, so too could Django. And he only had 2 fingers that worked on his left hand! Here are a few links to some of the great music of Django. Django's composition, "Nuages" I LOVE THIS TUNE!